Although Turkish Delight is relatively unknown here in the USA this delightful candy is something that can become quite addictive if you are not careful. 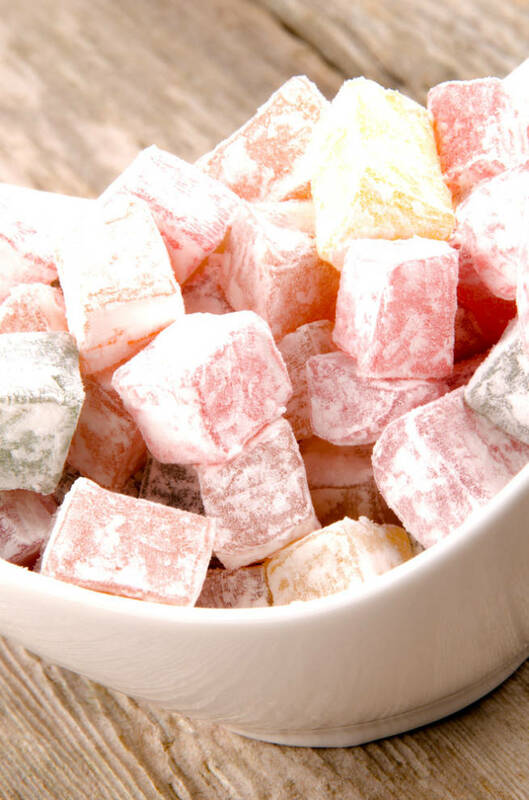 The texture of Turkish Delight is soft and gooey and that is what sets it apart from most candies here. When making this recipe it is vital you use a thermometer or your mixture can be quite gluggy. Other than that this recipe is pretty easy and something that stores really well. Some variations I have seen including adding peanuts or coating in chocolate. Oil a 9-inch square pan. Line with plastic wrap and oil the plastic wrap. In a heavy saucepan over medium heat, combine the sugar, 1 1/2 cups of the water, and the lemon juice. Stir until the sugar dissolves and the mixture boils. Reduce the heat and simmer gently, without stirring, until the mixture reaches the soft-ball stage (240°F on a candy thermometer). Remove the pan from the heat. In a second large heavy saucepan over medium heat, stir together 1 cup cornstarch and the cream of tartar. Gradually stir in the remaining 3 cups of water until no lumps remain. Stir constantly, until the mixture boils and is a thick, gluey paste. Slowly pour the hot sugar, water, and lemon juice syrup into the cornstarch mixture, stirring constantly. Reduce the heat and simmer, stirring often to prevent sticking, for about 1 hour, or until the mixture has become a pale golden color. Stir in the rosewater and tint as desired with food coloring. Pour the mixture into the prepared pan and spread evenly. Cool to room temperature and let stand, uncovered, overnight to set. Sift the confectioners sugar and the remaining 1/4 cup cornstarch onto a large cutting board. Turn the Turkish delight out and cut into 1-inch squares with an oiled knife. Roll pieces in the sugar mixture to coat well. Store in an airtight container with sheets of waxed paper, dusted with the sugar mixture, separating every layer. hmmmm I might have to make this for the kids for our Lion, Witch and the Wardrobe celebration. We have been doing our Stone Soup unit. I wish I had the energy to make it like you guys do. This looks like fun…I like that book too!